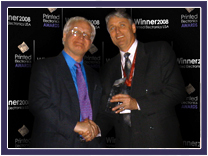 NovaCentrix wins this award for its PulseForge line of processing tools. PulseForge tools sinter in milliseconds metal and semiconductor inks, including on low temperature, flexible substrates such as PET and paper. Where ovens can require minutes or hours of processing time, the PulseForge tools require less than a second. The key element of the tools is the patented pulsed light technology which uses proprietary lamps to deliver the energy required to effect the desired material changes. Tools are available ranging from process development to full roll-to-roll processing, the latter being demonstrated for the first time at the event. The PulseForge tools are a significant step in allowing printed electronics to be manufactured at commercial scale and cost, overcoming many limitations. As a result, NovaCentrix were chosen by the judging panel as the winner of the IDTechEx Manufacturing Award. Plastic Logic has made advances in plastic electronics that are enabling the worlds' thinnest, lightest, largest and most robust plastic displays. Plastic Logic had to develop methods for manufacturing high-resolution transistor arrays at low-temperatures. The company developed a process that uses coating methods on flexible plastic substrates that enable a completely flexible active matrix displays that are thinner, lighter and more robust than glass. The company's manufacturing facility, which opened in September in Dresden, Germany, is the world's first commercial-scale plastic electronics manufacturing facility. Plastic Logic's display is core to Plastic Logic's first product: A ground-breaking e-reading product that provides a portable digital reading experience. The product will be to be released in the marketplace in Spring 2009. Plastic Logic wins the award for the plastic e-reader display. 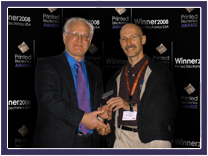 Epson has invested substantially in developing inkjet printing technologies for electronics, and wins the IDTechEx Commercialization Award for commercializing the technology in large-scale deployments. For example, at the Sharp Kameyama plant in Japan, Epson's inkjet printing technology is employed to print the color filters for Gen 8 (2160 x 2460mm) displays. The successful commercialization was achieved by Hisashi Aruga and his team at Epson. 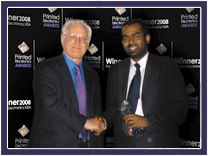 The Printed Electronics Champion Award is given to an individual that has done an extraordinary amount of work technically but has also participated in activities to promote and develop the industry. It is awarded to Dr Vivek Subramanian, Associate Professor at the University of California, Berkeley. Dr Subramanian is a co-founder of Kovio and is involved in the research and development of many different printed electronics technologies at the University of California, Berkeley. He lectures and advises companies around the World, promoting the industry. 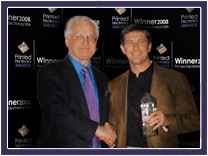 He is globally recognized as a leading industry expert. America's largest event on printed and thin film electronics. With over 80 exhibitors and more than 800 delegates anticipated - the whole industry will be at this event. Will you?